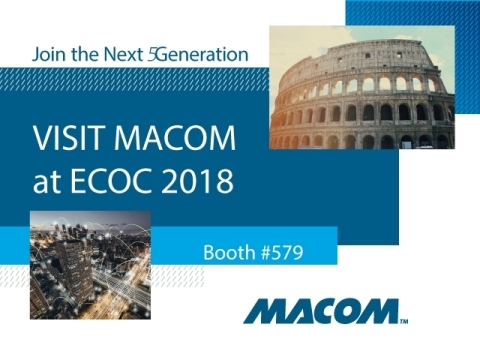 MACOM to Showcase Smart Solutions Supporting 5G, Cloud Data Centers, Client Access and Metro/Long Haul Applications at ECOC 2018 | MACOM Technology Solutions Holdings, Inc.
LOWELL, Mass.--(BUSINESS WIRE)--Sep. 13, 2018-- MACOM Technology Solutions Inc. (“MACOM”), will showcase its industry leading PAM-4, Silicon Photonics and 64 GBaud products and solutions at ECOC 2018, Booth #579 in Roma, Italy, September 23rd – 27th. MACOM’s optimized chips provide highly differentiated performance, power, size and cost solutions for next-generation Cloud Data Centers, 5G, Long Haul and Metro applications. Members of MACOM’s product management, engineering and applications teams will be available to answer any inquiries or questions at the show. For more information about ECOC 2018, visit www.ecocexhibition.com.